Sour Pickles Hunts: Sour Pickles Nominated for The Hunties..THE RESULTS!! Sour Pickles Nominated for The Hunties..THE RESULTS!! There was an event called The Hunties that was created by the masterminds of HUNTS SL and Happy Hunting TV. The event was based on feedback from customers, residents and hunters from all over the grid to nominate their favorite store or person for a category..well THE RESULTS ARE IN!! I just want to say thank you all for your support and hardwork that you have endured with me the past (almost 4 years) to be able to let the others in our world we call Second Life know of the hard work I have been doing! 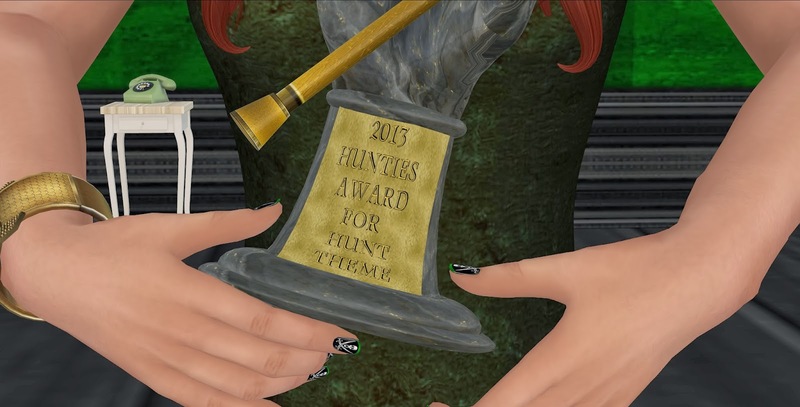 The Hunters have spoken and you, your store or your hunt was singled out for special recognition. Congratulations!! You will find your awards statue in this folder. It is copy only and has a resizer included with a script delete option. It comes to you in the smallest size.